Thank you to our Summer Security Camp Donors! Last month we wrapped up another successful summer membership drive. 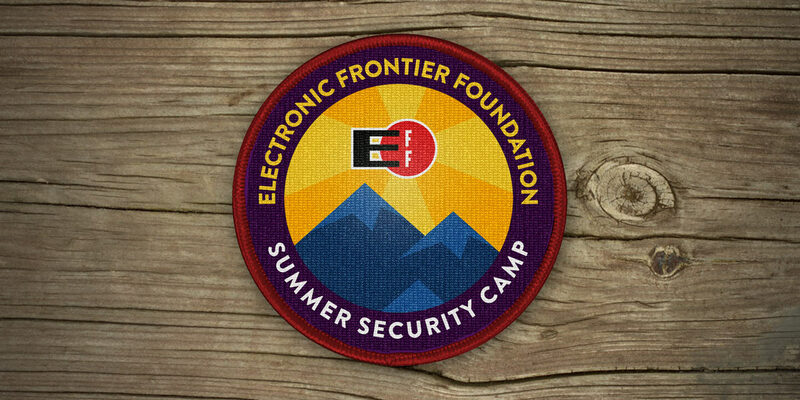 Thank you to everyone who participated in EFF’s Summer Security Camp! Whether it was sharing with your friends or helping us reach our match goal, you continue to make our work defending digital rights possible, and for that we are truly grateful. We would like to extend our special thanks to the Botero-Lowry family for generously funding our match campaign when we reached our goal of 1,000 donors. One more exciting announcement: our limited-edition Know Your Rights guides and commemorative EFF embroidered patch will be available on our online store very soon! PDFs of the guides in one-page format are available now (links below). Border Search Guide [pdf]: know your rights and defend your data at the border. Digital Security for Protesters Guide [pdf]: protect your communications while you’re out taking action. Surveillance Self-Defense Guide [pdf]: keep your information safe from prying eyes every day. Thanks again for standing with us and for your strong support!